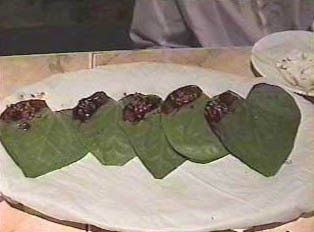 Food in Bangladesh differs from other South Asian cuisines in the spices that are used and in the increased amount of fish in the daily fare. A typical breakfast is an omelette of one’s choice, bread with butter and jam, and traditional tea served with sweet, thickened milk. Coffee is not commonly drunk in Bangladesh but rather is regarded as a beverage taken as a novelty from time to time. On weekends, some families serve a heavier breakfast consisting of a curry made from chicken, beef or vegetables, served with parathi, a round, flat bread fried in oil. During the week, breakfast is served between 7:00-7:30 a.m., whereas on weekends, breakfast can take place anywhere from 9:00 a.m. to as late as 11:00 a.m. Lunch is usually at around 1:00-1:30 p.m. every day of the week, although on weekends some eat as late as 2:30 p.m. Lunch and dinner are similar meals of rice, dal made of lentils, and curries of beef, chicken, meat, fish or vegetables. Fish is often served fried for either lunch or dinner. When possible, workers will go home for lunch, but the normally congested traffic conditions make it impossible for many to do so. There are many little shops, called “hotels,” where workers can find a decent plate of rice and curry for lunch. Since the average dinner hour is about 9:00 p.m. or even later, there is a tradition of afternoon tea. Tea is shared by the whole family at about 5:30 p.m. and consists of sandwiches, traditional dishes such as vegetables fried in dough, and tea. After dinner, people usually eat traditional desserts called "mistis" or "sweets." They are usually made of milk or cream, fried flour and sugar, and are prepared in different shapes and colors. "Ras Malai" and "Kaalo Jaam" are the names of some favorite sweets, which are sold in the many sweet shops in Bangladesh. Although ice cream is also a common dessert, guests usually take with them a box of these sweets when visiting people. Dhaka is famous for its international restaurants, which include Italian, many Chinese, Thai, Indian, Afghani, Turkish, Indonesian, and Mexican. Most international restaurants have high standards of cleanliness and décor. There are many small Bengali restaurants that serve excellent food, yet it is important to know that they are predominantly frequented by men. In the smaller cities and towns, one will mostly find Bengali restaurants with the occasional Chinese or Thai. There are no fast food chains in Bangladesh; however, numerous restaurants corrupt the names of famous chain restaurants in an effort to lure business. When eating out, one need not tip since the tip is normally included in the price. Single women need to keep track of what the menu says in terms of price since they are sometimes taken advantage of. One should never, ever drink water that is not bottled or purified by an in-house purifying system. Since untreated water poses such a serious health threat, a traveler should never drink unbottled water or even any beverage that contains ice. It is never considered rude to ask for bottled or mineral water in a restaurant. As well, travelers are warned never to buy cooked foods from the vendors selling food in open air stalls, since it is possible that these foods have been prepared with water from the tap or in less than sanitary conditions. Many vendors on the street sell bottled drinks and fresh fruit which is safe to buy. It is not unusual for a vendor to bring the cart right up to a car window. Since Bangladesh is predominantly Muslim, alcohol is only served in international restaurants. It is not uncommon, however, for cocktails to be served in some middle- to upper-class homes. Women are advised to ask a local friend or acquaintance for advice as to which restaurants and other situations are safe and comfortable for a traveling woman. A woman alone should never go to a traditional Bengali restaurant when outside of the cities, since these more provincial restaurants are only frequented by men. In the cities, women can safely patronize international restaurants when alone but should only go to Bengali restaurants when accompanied by a man or a Bengali woman. A relatively safe places to eat is at Cox’s Bazaar, a popular tourist area near the beach in the port city where there are many wonderful and reasonably priced seafood restaurants. "At an Ice Cream Parlor"